The HONEYWELL-POWER-HPF24S6 is a remote charger with a 6A power supply that includes a main printed circuit board, transformers, and a red enclosure. 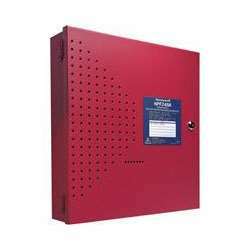 The unit may be connected to any 12- or 24-volt Fire Alarm Control Panel (FACP) or may stand alone. Primary applications of the HPF24S6 include Notification Appliance (bell) Circuit (NAC) expansion (to support ADA requirements and NAC synchronization) or auxiliary power to support 24-volt system accessories. The HPF24S6 provides regulated and filtered 24 VDC power to four Notification Appliance Circuits configured as either four Class B (Style Y) or Class A (Style A, with ZNAC-4 option module). Alternately, the four outputs may be configured as all non-resettable or all resettable or two non-resettable and two resettable. The unit also contains a battery charger capable of charging up to 18 Amp Hour batteries.